Each year the Swinging 'Gates visit two cities in the United States for the purpose of performing, this time around, six concerts. To that end, Emma, in her role as tour manager, received $23,000 from the University to make it happen—and from that came the cost of airfares, food and housing for 21 women. One night, she made dinner reservations for 36 people. “Difficult” was the word Emma used to describe bringing it all in within budget. Still, she said, it was not as difficult as getting through security at the Seattle airport with a broken metal detector and an insulin pump during the government shutdown. “I liked the alumni concerts,” said Emma, a history major who is thinking of becoming a lawyer. “We had a chance to talk about Colgate then and now. It was great.” The entire trip, she said, was “a learning experience”—from figuring out when to change her pump site given she was gone all day, to balancing a budget. 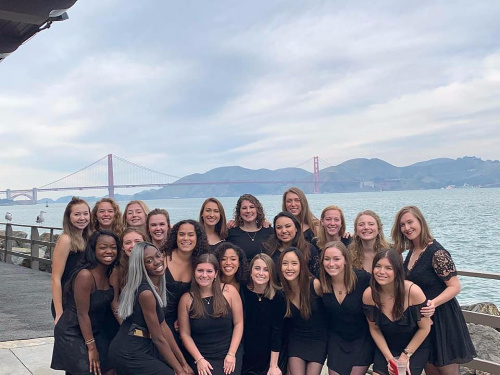 But her favorite was learning from Colgate graduates that no matter where in life she ends up living, she will always be able to sing a cappella. “That there’s always someplace to sing is nice to know,” she said.